NitroExpress.com: "Classic African Cartridges: The Giant Bores - 4 and 6"
"Classic African Cartridges: The Giant Bores - 4 and 6"
"Classic African Cartridges: The Giant Bores - Four and Six" by Ganyana, African Hunter Magazine. One of the first things the early Dutch settlers at the Cape of Good Hope discovered was how hoplessly inefficient their muskets were at killing most of the local game - so hopeless that a brass seven pounder cannon was removed from one of the ships and mounted in a cart as the best means of killing elephant or hippo! 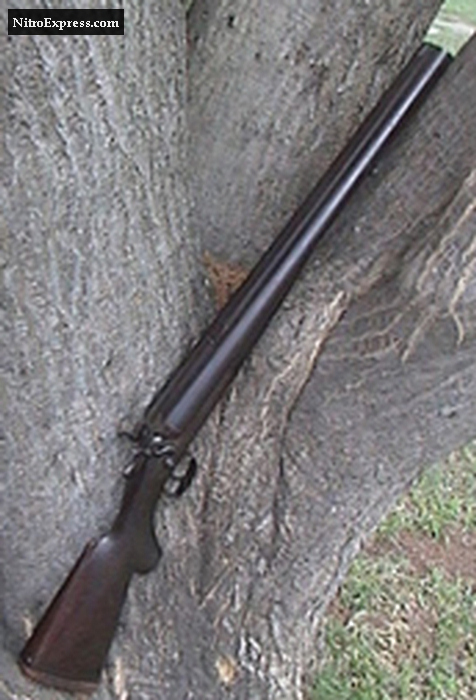 Fast forward a hundred years to the flintlock era, and the traditional Boer 'hunting' firearm was a giant smooth bore musket of about 8 bore, with a barrel between five and six foot long. 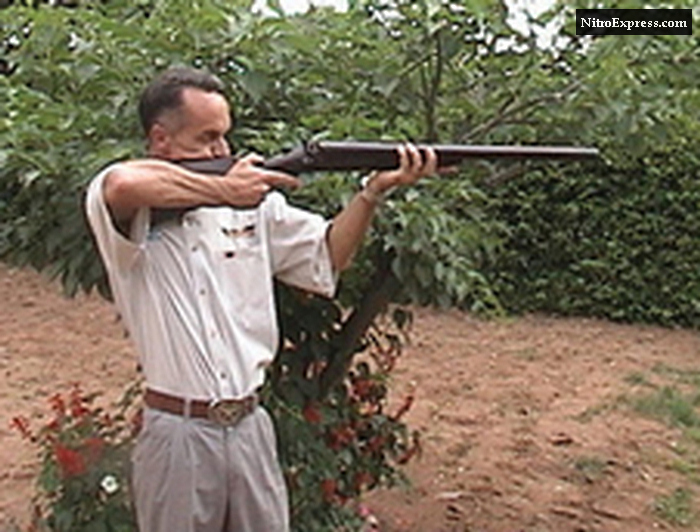 The early English settlers and hunters in the Cape and Natal also quickly came to the conclusion that African game required specialised, powerful firearms. With the growing size of the colonies in Africa, the gun makers of Holland, Belgium and England met the demand. 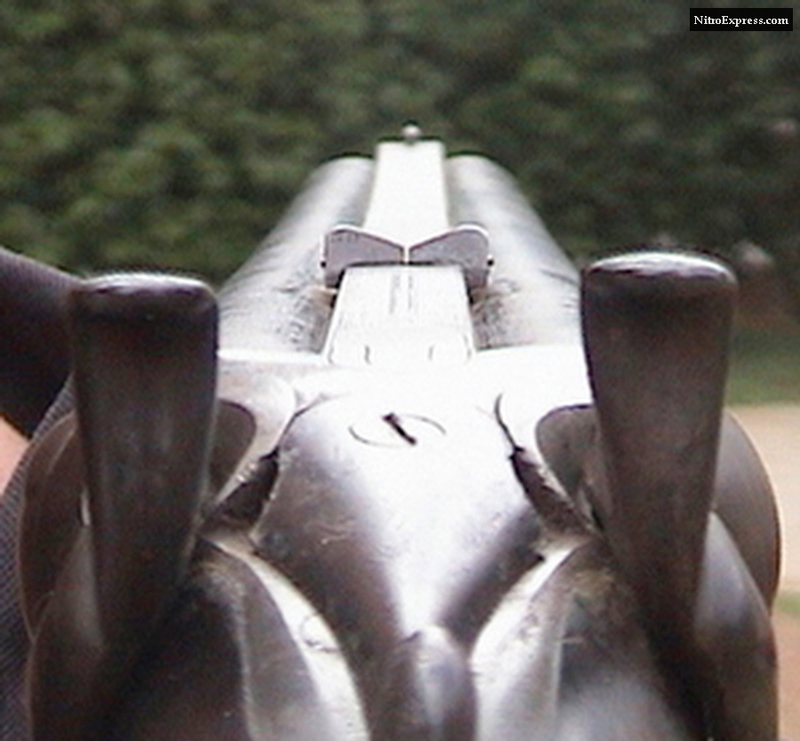 All were smooth bores, but the breech areas were reinforced so as to permit heavier charges of both powder and shot. Barrel lengths varied according to taste. Where men hunted on horse back, they were either very long or very short, where the tsetse fly reduced men to hunting on foot, short was definitely in. After 200 years of trial and error, four bore was standardised as suitable for elephant, while 8 bore was suitable for all the other big game. All quality firearms bore the unusual &#147;starburst&#148; emblem, which came to denote that the musket was proofed for heavy charges. No wimps please! At 17lbs loaded a 6 Bore double is not the easiest rifle to use. 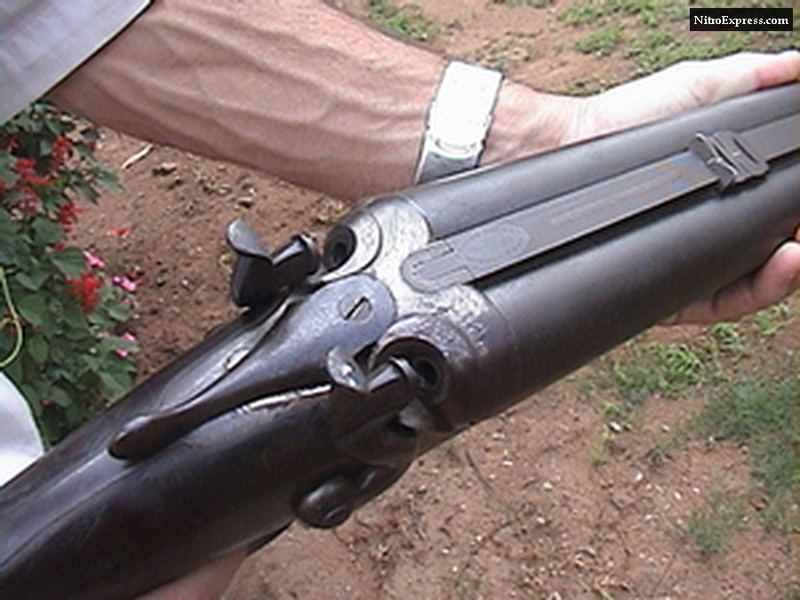 Greener's patent lock-up, with the cross bolt is very necessary on a large bore weapon. By 1850, the ivory trade was in full swing and parties of trek Boers had reached the frontiers of modern day South Africa, whilst small parties of adventurers, hunters or explorers had gone even further north. For general hunting purposes, the flint lock remained the favourite form of ignition almost up to the cartridge era along the frontier, but for hunting dangerous game, percussion ignition became the standard. Rifling was well known, and its advantages also well known for general hunting or war, But for elephant, the smooth bore hung on - hunters having discovered that rifling tended to reduce penetration achieved by a round ball, whilst also slowing down the speed of the reload. That is not to say that good large bore rifles were not made, for indeed they were, although their use was generally restricted to visiting sportsmen rather than working hunters. In 1840 Sir Samuel Baker had his first specialised 'elephant' rifle built By George Gibbs of Bristol. This was one of those early designs that took a bullet with a large wide &#147;belt&#148; cast into it to take the very deep two groove rifling. This rifle was a 6 bore, percussion piece, using 4 ounce conical bullets, driven by 16 drams of powder. At 21lbs weight and with a 36" barrel, it was not for wimps, to either carry or fire! (Extracted from Wild Beasts And Their Ways, by Sir Samuel Baker, 19891) Selous, who started his hunting career in 1870, soon discovered that his .577 cartridge rifles (.577 2¼") were not the ticket for elephant, and even his ten bore was sadly lacking in the penetration department. He soon came to posses three four bore muskets which certainly put the elephants down but the recoil so shattered young Selous nerves that he wrote that it affected his shooting ever afterwards. The celebrated English gunsmith W. W. Greener, conducted the most thorough research into suitable rifles for Africa, and after much experimentation and lengthy discussions with returning hunters, including Sir S. Baker, he became convinced that 8 bore was the biggest size needed - and practical. An 8 bore double rifle could be built to weigh around 14lbs if fitted with 20" barrels, and that with a three ounce hardened lead bullet (1312grns) backed by 14 drams of powder (for around 1600fps) gave better penetration than a four ounce round ball from a four bore (at around 1900fps). 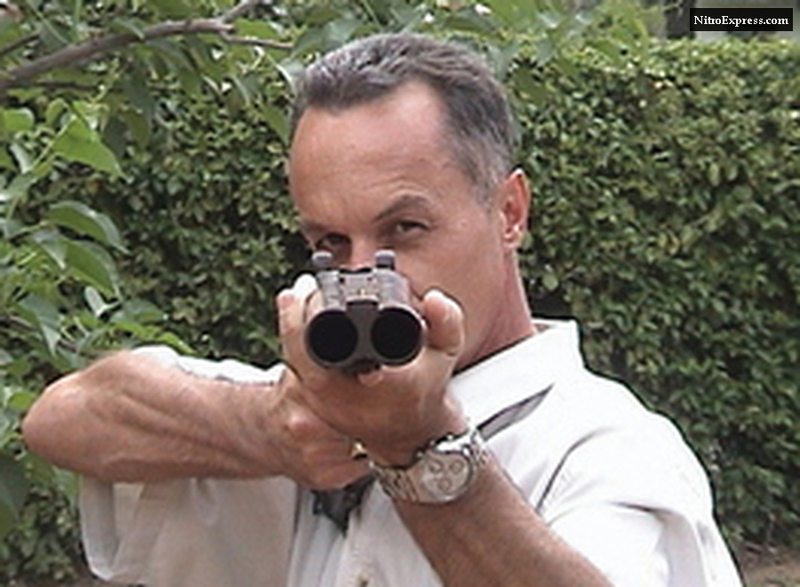 He also discovered that rifling greatly increased the felt recoil. After a few experiments he felt he could not recommend building anyone a rifle larger than eight bore. For those who wanted it, he would build a four bore, but as a smooth bore only. In practical elephant hunting terms this was no handicap, since elephant were (and still are) invariably shot at very close range, a smooth bore was sufficiently accurate - particularly when used with factory made cartridges and swadged bullets that were a perfect fire for the bore. A Hollis & Son 6 Bore percussion Muzzle loading rifle. It&#146;s previous Shangaan owner has reinforced the stock attachment with copper braiding. This rifle was still in regular service for buffalo hunting when it was recovered off the poacher in 1994. Despite the research carried out by Baker and Greener, which by 1880 had become conventional wisdom in the trade, there were plenty of men on the frontier who felt the need for something bigger than 8 bore - just as today, after a narrow scrape a hunter looks at his .450 and then goes in search of a .500 or .577! In terms of terminal effect, the old eight bore was rated more effective than the .577NE on buffalo or body shots on elephant, but still would not reliably drive a bullet into a buffalo&#146;s brain from the front. Professional ivory hunters wanted more clout, and Greener, Holland & Holland, Woodward, Purdy all turned out a steady trickle of four bores, but almost none rifled. Many of the smaller makers reworked punt guns to produce relatively cheap single shots for those ivory hunters who couldn&#146;t afford a decent double. Six bore had been quite popular during the muzzle loading era, particularly amongst those who wanted a rifle rather than a smooth bore. As cartridges and breech loaders came in, four bore - a very popular size for punt guns - became standard. The six bore and the giant two bore, with its explosive shells, faded. Not entirely though, for if a man really, really wanted a rifle larger than 8 bore, then 6 was a logical size. If it was a smooth bore he was after, then he could use the standard shotgun shells for the punt guns in a push (these brass shotgun shells were not really strongly enough constructed to take a full charge and conical bullet, but were often loaded with a round ball when ammunition ran low) or he could use it as a dual purpose peace with buck shot for plains game and a six ounce dose of bird shot if he fancied a guineafowl for supper! If you had a rifled piece though, then utilisation of shotgun ammo was not a consideration, and you were stuck exclusively with the &#147;made to order&#148; heavy brass reloadable shells supplied with your rifle. One such frontiersman who wanted something bigger than an 8 bore was a trekker called Viljoen, who settled in Rhodesia&#146;s eastern districts in 1891. After a bad experience with lions he wanted a rifle what would not only stop a charging cat but skin it simultaneously as well. He also wanted to hunt elephant and buffalo, and he wanted a rifle. It must of taken some serious persuasion to get Mr Greener to build one for him, but build one Greener did. 20" barrels, 17½lb weight, 11 lands and grooves, right hand twist. Although the rifle was built with Metford style rifling which was all the rage in target shooting circles of the day, Greener broke with British convention and used a right hand twist, rather than the more usual left. 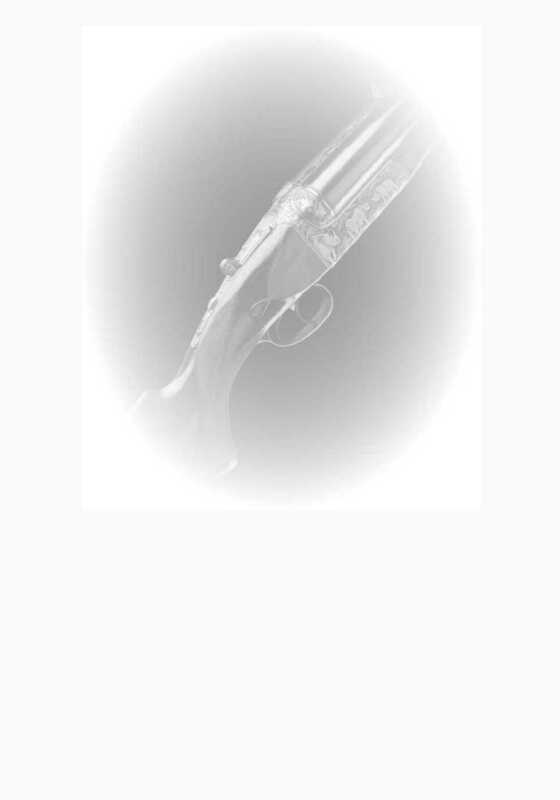 (Incidently he did the same for his 8 bore rifles built for right handed customers. Left handed customers got rifles with a left hand pitch to the rifling). The reason was simple - as the bullet takes the rifling it imparts some degree of &#145;torque&#146; which in a rifle of this size is significant. By using a right hand twist, the torque is away from the shooters face (for a right handed client) and so does not exacerbate the problem. A 1750grn bullet at around 1550-1600fps is not something to fire lightly! Ammunition supplied was of three styles. Hardened lead (with tin and pewter) bullets for elephant, rhino etc; slightly hardened lead (1:20 tin) for buffalo, and pure lead with a copper tube hollow point for lion. One wonders what type Mr Viljoen selected to drive his human attackers away from his waggon as he and his family trekked towards safety during the Mashona rebellion in 1896? Hard proof though slowly meant the demise of the big bores. The extra weight, recoil and expense and difficulty of ammunition procurement made them unattractive compared to the 8 bore. Also Greener&#146;s experiments in the UK were being validated on the hunting fields of Africa. The 8 bore was as much as any man could handle and more than any game animal could! 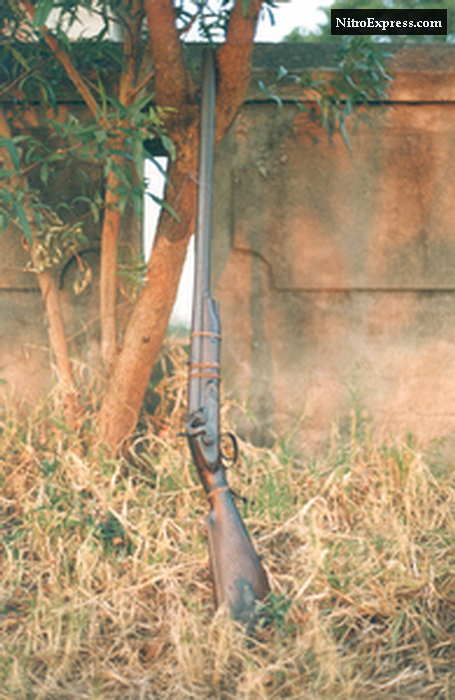 The introduction of the .450 NE in 1898 spelled the end of the giant bores for elephant hunting. A .450NE&#146;s jacketed bullet could reach the brain from any angle which no 4 or 6 bore with their hardened, paper patched bullets or balls could. Also, there was no smoke. The .450 NE was simply such a superior weapon for elephant that giant bores came to an abrupt end. Amongst the buffalo and lion hunters the 8 bore hung on for another 20 years in the backwoods areas, there being few things that can crumple a charging lion or buff like an 8 bore - but even then, a .577NE with good soft points comes pretty close and is safer for use on elephant as well. Even the advantage that black powder cartridges were easily reloaded whereas the new cordite filled Nitro expresses were quite simply not reloadable soon fell by the wayside. By 1900 Africa was being opened up so fast that there were few areas where a man could go hunting that wasn&#146;t within reach of a store and an ammo re-supply. The Congo basin, and the back end of Uganda were about all that were still truly remote, and the elephant hunters who penetrated there wanted .303&#146;s or 7mm&#146;s, as much for fending off hostile tribesmen as shooting elephants! Also, it was an inescapable fact. A man armed with a 7mm Mauser was safer facing a charge than a man with a 4 bore. 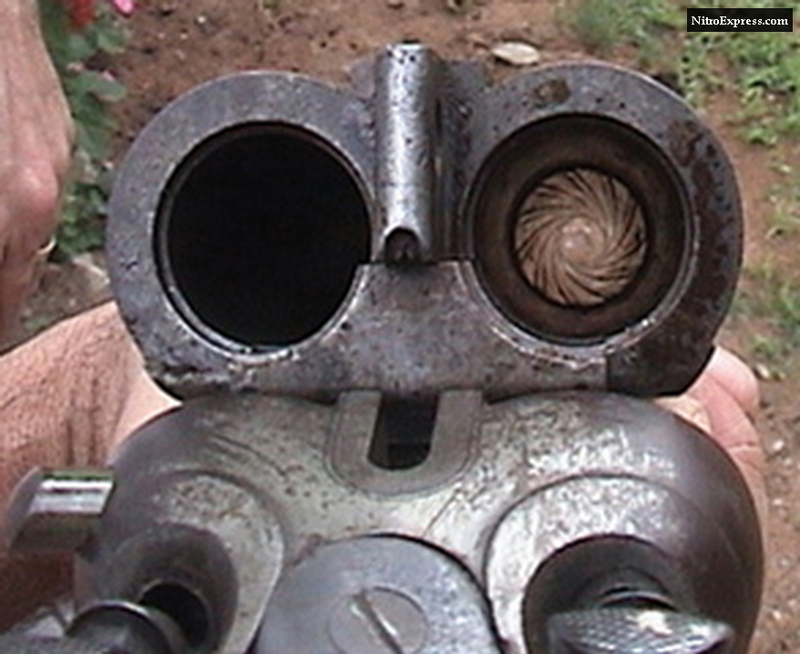 From the side, a 7mm also killed more cleanly and quickly allowing the hunters to make greater hauls. 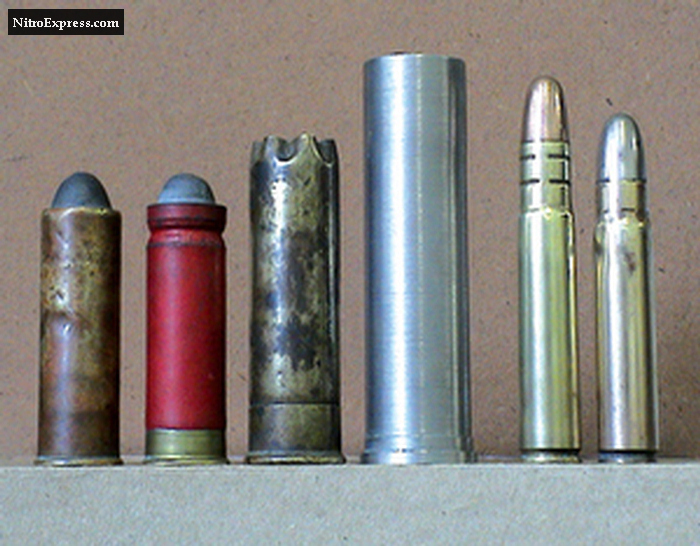 L to R: Two 12 Bore rifle rounds, the brass cased round was for use in rifles only, while the paper cased hollow point could be used in either a rifle or 'explora' or 'paradox' type combination rifle/shotguns. A brass cased 8 bore shotgun shell. Those intended for rifles were usually made out of thicker brass so as to be easily reloadable and survive numerous firings. A stainless steel case turned up to enable a four bore rifle to be put back into service. In reality, the 6 and 4 bores proved less effective on all big game than their replacements, the .505 Gibbs and .500 Jeffery at right. How you want to see your buffalo, over the top rib of a 4 Bore. Mr Viljoens prized 6 bore was traded off, and in use by 1930 as a children's play 'cannon' by a young boy named Peter Walls, later to be famous as the last commander of the Rhodesian Army. How the mighty have fallen.